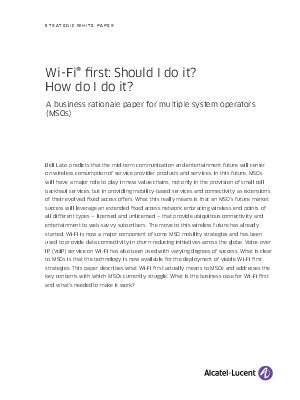 > Alcatel-Lucent > Wi-Fi® first: Should I do it? How do I do it? Like other communications or media industries, MSOs operate in dynamic and extremely competitive markets. Their end users expect the freedom to extend their fixed access broadband service to a nomadic environment. To address user expectations and demand, many MSOs have evolved their end user offerings to include market-leading fixed high speed internet access, WiFi connectivity, and bundled mobile cellular services.In some markets, MSOs have already invested in Wi-Fi and offer data connectivity services in and out of the home. This is not only a customer retention strategy, it also lets MSOs build out further value added services and can reduce data costs for those with MVNO agreements. Bell Labs predicts that the mid-term communication and entertainment future will center on wireless consumption of service provider products and services. Download this white paper to learn how a Wi-Fi first strategy helps MSOs remain competitive.